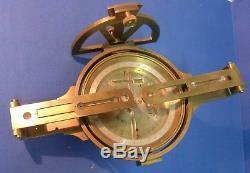 This is very nice W. Watson & Sons gimbaled surveyors mining compass that dates to about 1885. 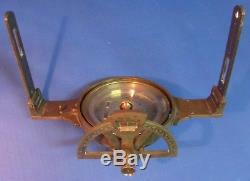 As you can see from the photos it has a nice medium patina finish, it does not have a box or anything else with it. 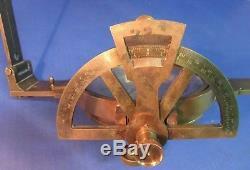 This instrument measures 12 inches long andhas a 4 inch long compass needle. 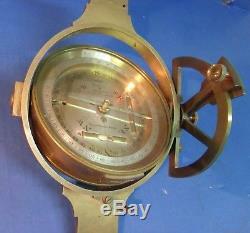 This is the only gimbaled mining compass I have seen with the vertical arc above the compass, normally the vertical arc is below the compass. It comes with what you see in the photos nothing else. 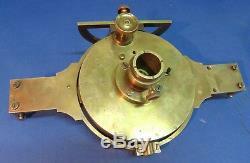 Here is some information on the firm W. Was an optical instrument maker. 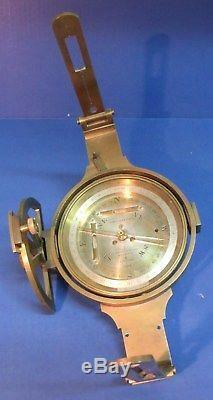 In 1837, the William Watson business was established in London for the manufacture of. By the 1840s, the company moved into lanterns, slides and associated equipment. In 1868, the name was changed to W. Watson & Son and by this time were located at 313 High Holborn, London. Into the 1940s, the company remained at 313. On 9 January 1881 William Watson died. In 1883, the name of the company was changed to W. Watson & Sons as the son, Charles Henry Watson joined the business. The warehouse and show room remained at 313. In 1903, a section in the journal Knowledge lists an assortment of equipment available from the company: microscopes. 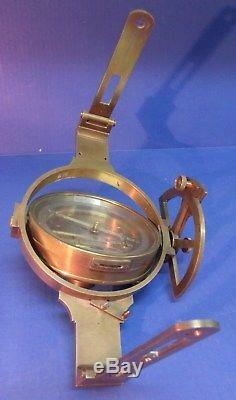 Apparatus that included complete outfits for. In 1908, the firm became W. On 10 August 1938, Charles Henry Watson died. In 1912, the company employed their equipment and demonstrated the utilization of. Electricity to enhance the growth of plants in a nursery near London. In 1929, an advertisement in the. Catalogue announced an Optical, Scientific and Photographic Exhibit. The exhibition featured manufacturers of microscopes for medical, industrial, and educational purposes and for the amateur, prism binoculars, astronomical and portable telescopes, photographic lenses and cameras, surveying and measuring instruments. 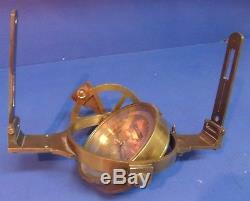 And scientific apparatus of every description. Watson & Son company exhibited in the Scientific Section at Stand No. In 1947, the firm was a Listed Exhibitor at the. The Fair featured manufacturers of microscopes for all purposes and auxiliary optical and mechanical accessories. The company offered photometers, telescopes, prism binoculars, photographic lenses of all types, and optical elements in every form. Watson & Son exhibited in the Olympia Room, Ground Floor at Stand No. In January 1905, the display of apparatus at the Annual Meeting and Exhibition of the. Those in attendance were treated to items and displays of much interest, several items on display for the first time. Apparatus was featured to a lesser extent than shown in previous years, but appliances for. Excerpt from the Exhibit handbook follows. Watson & Sons 313, High Holborn, W.
Showed Protective X-ray Gloves of a useful type, made of opaque flexible material, and very convenient for practical use; also an X-ray tube with a special arrangement of electrodes for improving the quality of the X-rays when operated with a coil by diverting the inverse impulses of the field of action. It is claimed that, with one of tubes, a high potential transformer can be employed direct in X-ray work without the need for any valve tube or other " rectifying " device. The anode, or second terminal, is at a distance from the antikathode, and is so placed in the tube that when the current is in the reverse direction its bombardment is directed into a depression at the back of the antikathode where it is innocuous. 18881958, business address at: 313. 1890, factory at: 9, 10, 11, 16, 17 Fulwood's Rents, London, England. 18901891, branch office at: 251. 18971901, business address at: 78 Swanston Street, Melbourne, Victoria, Australia. 1901, business address at: 16 Forrest Road. 19141939, factory at: Bell's Hill. 1914, business address at: 184. George Watson (1857-after 1881) partner, 1881. Thomas Watson (18551897) partner, 1890s1897. Charles Watson (18661938) partner, 1930s1938. (18661944) scientific adviser and lens designer, c. (18711928) photographer's apprentice, and later. 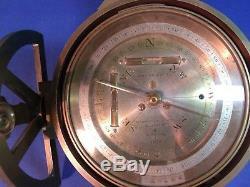 The item "Circa 1885 W. Watson Sons Gimbaled Surveyors Mining Compass unusual Vertical Arc" is in sale since Friday, January 25, 2019. 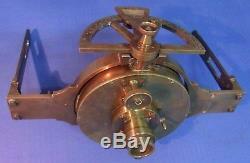 This item is in the category "Collectibles\Science & Medicine (1930-Now)\Engineering\Surveying Equipment". The seller is "klony" and is located in Kalispell, Montana. This item can be shipped worldwide.